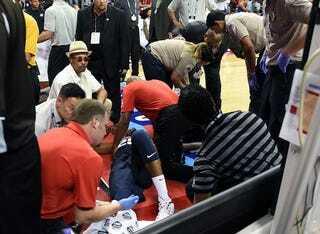 In tonight's Blue-White scrimmage as Team USA preps for the FIBA World Cup, Paul George broke his lower right leg. Be warned, the image is gruesome. At the start of the fourth quarter, George chased down James Harden on a fast break, and as he landed, his right leg was caught under the basket stanchion, snapping his lower leg. ESPN decided to not show the replay more than once during the original broadcast, which is completely understandable. George's leg was put in a splint, and emergency medical personnel removed him from the court on a gurney. The stanchion on the court was two feet and two inches closer to the baseline than the ones used in NBA arenas. Games are hosted there regularly, including for the NBA's Summer League and D-League, but not typically with veteran NBA players used to more space under the basket. The inability to clear more space behind the baseline is apparently one reason the NBA doesn't play games in Las Vegas. Coach Mike Krzyzewski addressed the crowd after George was taken off the court, and ended the scrimmage without playing out the fourth quarter. He and Jerry Colangelo said afterward that they would postpone announcing the final roster for Team USA, which was originally expected Saturday. According to Ramona Shelburne, George was taken to the Hospital for Special Surgery in Las Vegas, along with his family. We'll update with any additional information about George's status as it comes out.